Provide comfort for the family of Sterling Patterson with a meaningful gesture of sympathy. It is with sadness that we announce the passing of Sterling on Sunday, December 30, 2018 at the Perth and Smiths Falls District Hospital at the age of 92. Sterling was the beloved husband of Edna (Norris) Patterson of Forfar. 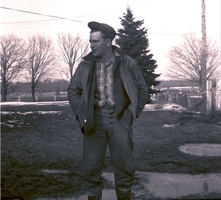 He was the loving father of Ron (Judy) of Jasper, Paul (Patsy) of Forfar, and Don (Karen) of Forfar, and loving father-in-law of Audrey of Smiths Falls. Sterling was predeceased by his parents Frank and Mildred Patterson and son Stuart. Grandfather to Troy (Haylee), Renee (Brandon) and Crystal and Great Grandfather to Keira, Kalyn and Khloe. Sterling was a longtime member of the Masonic Lodge, Newboro. Friends may pay their respect at the Lyons Funeral Home, 51 Concession Street, Westport, Ontario on Saturday, January 5, 2019 from 1 to 2 p.m. Memorial service will follow in the chapel at 2 p.m. Graveside service at a later date. In lieu of flowers, contributions may be made to the Newboro United Church. To send flowers in memory of Sterling Patterson, please visit our Heartfelt Sympathies Store. We encourage you to share your most beloved memories of Sterling here, so that the family and other loved ones can always see it. You can upload cherished photographs, or share your favorite stories, and can even comment on those shared by others. Beth Chant and Earl Mattice have sent flowers to the family of Sterling Patterson. Condolences toKaren ,Patsy and families on Stirling passing His smile and wisdom will be missed. His love ofFamily and farm toys will always be remembered. Very sorry for Your loss. Dale Somerville. Jack, Marnie and the Gipson family.